Swimming through the Caribbean seas with a tribe of Glublubs, Man-Ray happens upon the remains of Null’s old Deepdump base that he and the Turtles destroyed. Inspecting the wreckage, he sees that Kid Terra was true to his word and has removed all the toxic waste. Suddenly, a mysterious shark-like figure brains him from behind with a steel girder and everything goes black. 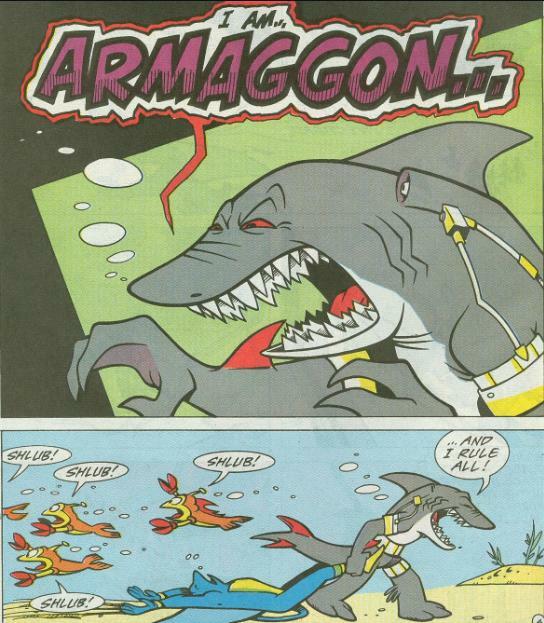 The villain reveals himself to be a mutant shark-man named Armaggon. Earlier, the Mutanimals, Juntarra and Kid Terra bid the changeling Azrael goodbye. Her duty was to greet all those following the path of the four winds and, once their journey has been completed, she must leave them. Thanking the Mutanimals for saving the four winds, Azrael transforms into an eagle and takes flight. Man Ray sees to Kid Terra (still recovering from his bullet wound) and asks him how he got captured by Null. Kid explains that after he finished cleaning up the Deepdump base, he was relaxing in Aruba when a poisoned drink knocked him unconscious. He then woke up in Null’s clutches. Now knowing that the waste has been removed, Man Ray decides to find the Glublubs and lead them back to their ancestral home. Finding them in the Valle de la Ninfa (“Valley of the Mermaid”), the Glublubs tell him stories of a fish-man haunting the valley. Brushing off their superstitions, Man Ray leads them back to the Deepdump base (and we all know what happened when he got there). Picking up where the intro left off, Man Ray is unconscious with the steel girder wrapped around his arms. Armaggon scares off the Glublubs and proceeds to gather wreckage from the ruins of the base. Suddenly, he is attacked by a one-eyed French merman named Jacques the Merdude, heir to Lord Neptune. They tussle and Armaggon gains the upper hand when he seizes Merdude’s trident. Before he can strike, a Glublub riding a manta ray distracts him. Merdude reclaims his trident and lays Armaggon out. Thanking the heroic Glublub, Merdude sees to waking Man Ray with squid ink. Unbinding Man Ray, Merdude introduces himself as one of the last remaining members of his people. He occasionally visits the Valley of the Mermaid to court the mermaid-herself, leading the Glublubs to fearfully think the place haunted by a fish-man. Man Ray is happy to meet him, though he is worried about the gathering school of hungry sharks. Armaggon has awoken and summoned forth the sharks who attack Merdude. As Merdude tends to them, Man Ray takes on Armaggon. Armaggon explains that he is an evolved, hyper-intelligent shark from the future whose advanced brain allows him to exist in different time periods at will. As a time-slip opens, Armaggon gathers his salvage and heads for the exit. Merdude races to stop him, only for Armaggon to seize him and pull him into the time-slip just as it closes. Later, a glum Man Ray returns to the beach where he’s greeted by Mondo Gecko. Mondo shows him all the cool shark’s teeth he’s found on the beach. Man Ray plucks several of Armaggon’s teeth out of his scales and adds them to Mondo’s collection, promising to tell him about them some time. *This story is continued from TMNT Adventures #40. 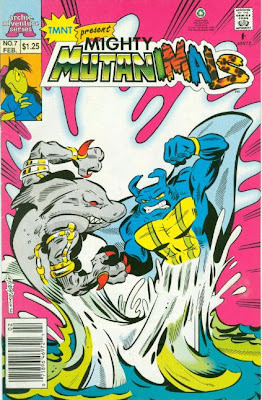 The story continues in Mighty Mutanimals #8. *Null’s Deepdump base was destroyed in TMNT Adventures #16. *Kid Terra left the Mutanimals to deal with his past mistakes in Mighty Mutanimals #1 and was shown captured by Null in Mighty Mutanimals #5. 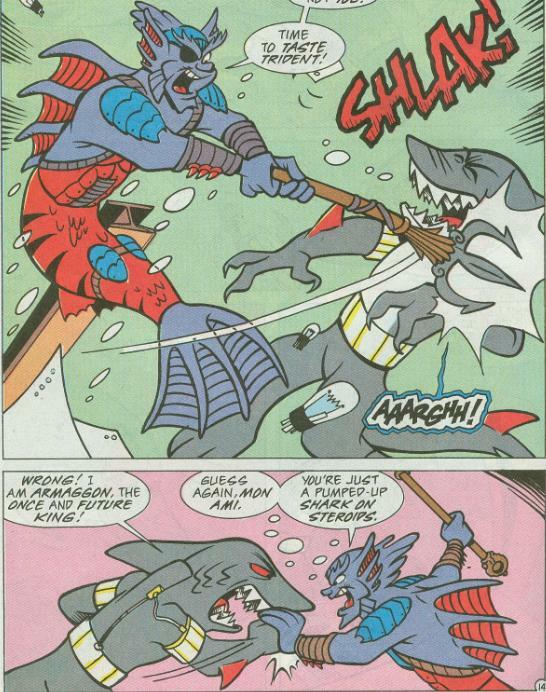 *Kingfish, another of Merdude’s race, was previously seen in TMNT Adventures #26, though he was described as being “the last of his kind”. *Time-slips previously appeared in TMNT Adventures #36. *Armaggon and Merdude will return in TMNT Adventures #42. *The Mermaid Merdude has been courting will return in Merdude and Mondo Gecko #2. *In the letters page to TMNT Adventures #63, Murphy explains that while the character of Armaggon was created by Peter Laird, he came up with the name after seeing the word “Armageddon” misspelled in another comic book. *In his one appearance in the Fred Wolf cartoon, the episode "Atlantis Awakes", Merdude's real name was Alim Coelacanth. He also wasn't French and had both eyes. Yay! A Playmates toy character gets another spotlight! We won’t be seeing many more of those for the rest of the series, by the way, so enjoy it while you can. A Merman named “Kingfish” was briefly introduced way back in TMNT Adventures #26, though nothing was ever done with him after the fact. Merdude seems to be an evolution of that character, albeit with a more interesting design (and a personality). Kingfish was described by Boss Salvage as being “the last of his kind”, though here that fact is retconned. Merdude seems to at least meet the matter halfway, though, explaining that his people are very rare. Meanwhile, Armaggon is a character that, as a kid, I always thought was made-up for the Konami TMNT Tournament Fighters video game. 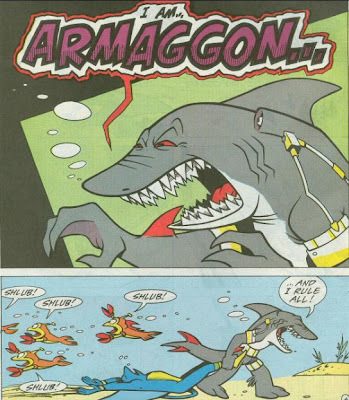 So it’s always a thrill for me to see him appear in the Archie comics (but unlike Merdude, Armaggon never got a toy). Armaggon and Merdude both show up in this issue completely at random and at the convenience of the plot. 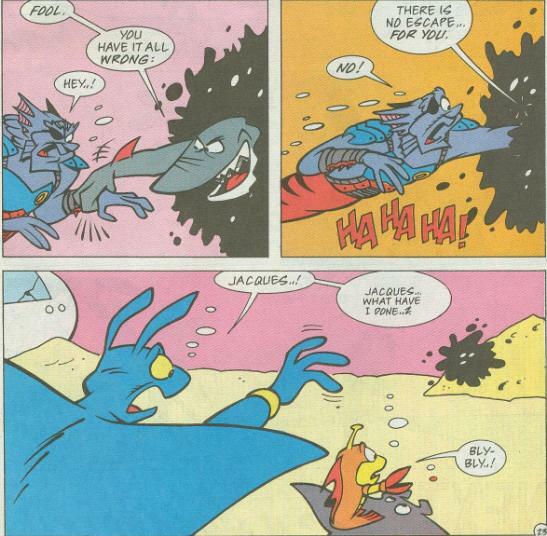 It’s a bit sloppy, as Merdude’s only foreshadowing was the background character of Kingfish from some years back, while Armaggon’s plot thread is resumed in TMNT Adventures and does not play out in Mighty Mutanimals. 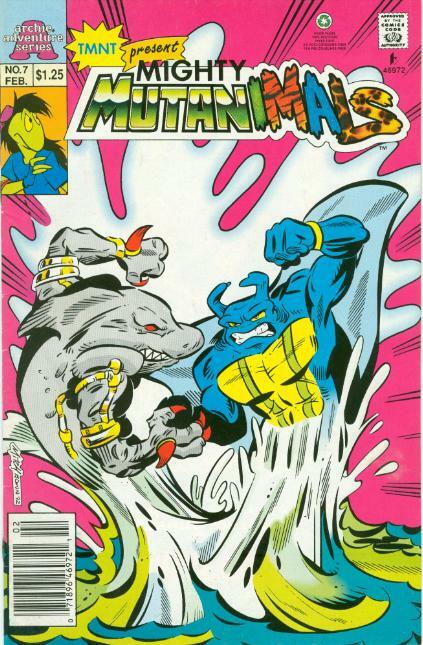 While the events in this issue combine with those seen in TMNT Adventures #35 and #36 as a prelude to the epic “Future Shark Trilogy”, they have little to do with the Mighty Mutanimals comic book, making the issue seem rather needless if you’re just reading through the Mutanimals series. Kazaleh’s humorous style fits the eccentric character of Merdude rather well, though Armaggon is presented as being more “cute” than “scary” here, which does a minor disservice to the threat of his character (who is the next “big bad” in TMNT Adventures). When it comes to Kazaleh, I really like his expressive and fun character work, it’s just his backgrounds and environments that leave me disappointed. You’ll notice that in his issues of Mutanimals he rarely draws detail in the surroundings of the characters and the art can look duller than it should because of it. This issue is especially bad, as most of it takes place underwater, where Kazaleh draws absolutely nothing outside of the characters, leaving colorist Barry Grossman no alternative but to just block color each panel’s background with bright pinks and greens to try and make things interesting. As an introduction to Armaggon, this issue doesn’t do a particularly good job of making him out to be a very threatening villain, but that has more to do with the overall tone of Mighty Mutanimals being lighter and sillier than its sister title, TMNT Adventures (which at this point was getting rapidly darker by the minute). Still, with the Four Horseman arc completed, this issue does a good job calling back to a plot thread begun years ago in TMNT Adventures #16 and left dangling after Mighty Mutanimals #1. That cover by Ken Mitchroney and Ryan Brown was EPIC, dude. In my mind, I tend to get the events of this issue confused with the similar story in the Merdude & Ray Fillet issue in the 3-issue Merdude mini-series that came a while later.